A shoot of Daizy Cooper a.k.a SunnySuccubi by yours truly and Forrest Black is nominated for Best Gothic Shoot in the 2018 AltPorn Awards! You can vote for us by visiting AltPorn.Net and using their contact form or tweeting Blue Blood Daizy Cooper #altpornawards to the @AltPornNet Twitter. A shoot of Penny Poison by yours truly and Forrest Black is nominated for Best Gothic Shoot in the 2018 AltPorn Awards! You can vote for us by visiting AltPorn.Net and using their contact form or tweeting Blue Blood Penny Poison Feathers #altpornawards to the @AltPornNet Twitter. A shoot of Malice McMunn by yours truly and Forrest Black is nominated for Best Punk Shoot in the 2018 AltPorn Awards! You can vote for us by visiting AltPorn.Net and using their contact form or tweeting Blue Blood Malice #altpornawards to the @AltPornNet Twitter. A shoot of Daizy Cooper a.k.a SunnySuccubi by yours truly and Forrest Black is nominated for Best Nerd Shoot in the 2018 AltPorn Awards! You can vote for us by visiting AltPorn.Net and using their contact form or tweeting Blue Blood Daizy Cooper #altpornawards to the @AltPornNet Twitter. A shoot of Scarlet Starr by yours truly and Forrest Black is nominated for Best Nerd Shoot in the 2018 AltPorn Awards! 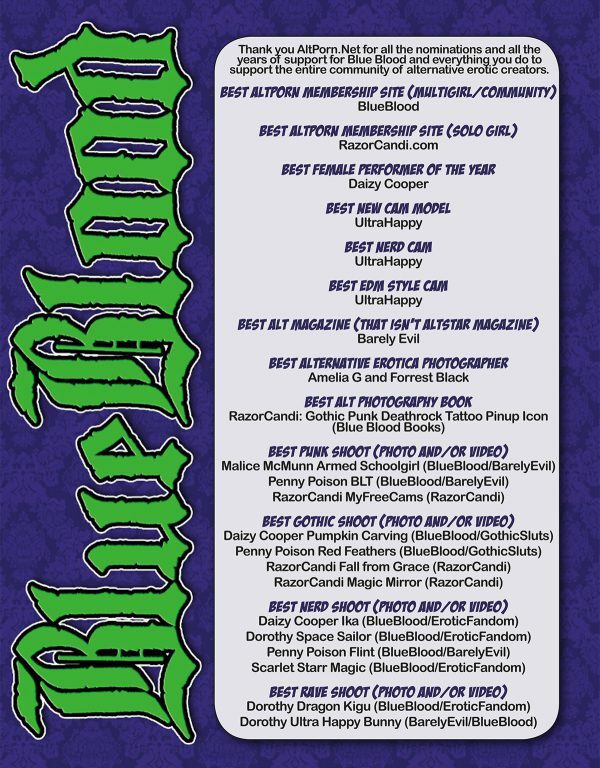 You can vote for us by visiting AltPorn.Net and using their contact form or tweeting Blue Blood Scarlet Magic #altpornawards to the @AltPornNet Twitter. A shoot of Penny Poison by yours truly and Forrest Black is nominated for Best Punk Shoot in the 2018 AltPorn Awards! You can vote for us by visiting AltPorn.Net and using their contact form or tweeting Blue Blood Penny Poison BLT #altpornawards to the @AltPornNet Twitter. A shoot of Dorothy by yours truly and Forrest Black is nominated for Best Burner Shoot in the APN 2017 AltPorn Awards! A shoot of Penny Poison by yours truly and Forrest Black won Best Gothic Shoot in the AltPorn Awards! A shoot of Pandora Von Kit by yours truly and Forrest Black won Fan Favorite Best Burner Shoot in the AltPorn Awards!